As soon as we put away our shorts and sandals, we start to feel the pressure of the holidays creeping in. After all, it will be here before we know it, right? But there are things you can do to have a more enjoyable holiday season, and it all comes down to advance planning. First, put pen to paper and make a written plan, including gift recipients and a detailed budget – both a total budget and a breakdown of that budget by recipient. Once you have your budget, you can begin matching up gift ideas to that budget, and don’t forget to be creative! When you give yourself enough time, you can even plan to make gifts to save on gift expenses. Plus, people tend to overspend more when they shop at the last minute, making desperate purchases – so give yourself plenty of time to get the items on your list. 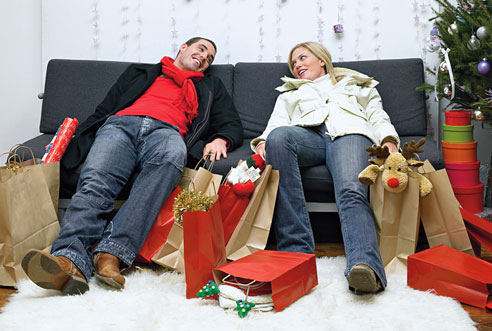 By shopping early, you give yourself enough time to actually enjoy the holidays – and you can shop from a better selection and with fewer crowds. As you shop, try to keep your distractions to a minimum. That means only go when you are not tired or hungry or have to keep up with family members. Start with the clearance racks and don’t let a salesperson talk you into something you don’t want. And remember, gift cards or charitable donations can offer a stress-free alternative for you, and can be a welcome gift to the hard-to-shop-for person on your list. When paying for your purchases, try to use cash so you won’t be tempted to rack up credit card debt, and read any fine print involved with special promotions and offers. Always keep your receipts and ask about the return policy. When you get home with the receipts, include a gift receipt with the gift and keep the original receipt in a secure and organized location. Get togethers can also be stressful at the holidays. Advanced preparation can help alleviate at least some of that stress. You can begin with a written plan, including dates, menus, travel arrangements and the like. Pin down and make arrangements for all the details of your travel as far in advance as possible, and if you are having house guests, start making preparations early for their arrival, such as any home repairs or other accommodations needed. You can even cook many dishes in advance and store them in the freezer, and you can also enlist the help of family members and friends who will be joining you as well. When the holidays are done and gone, take a deep breath and relax. Treat yourself to something soothing – and then start saving and planning for next year. *First Financial is not responsible for the content listed on any external websites. This entry was posted in Holiday and Seasonal Finances and tagged Holiday and Seasonal Finances, Saving Money by M2 The Agency. Bookmark the permalink.